What do international solidarity and support networks look like for climate activists? A group of young leaders from around the world is meeting in Istanbul next week to discuss just that. I will be one of just eight Americans at the summit, and will be a representative of the fossil fuel divestment movement here, as I have spent the last few years organizing a divestment campaign at Swarthmore College in solidarity with communities fighting against mountaintop removal and fracking. But as someone coming from the United States, and doing solidarity organizing, my primary job will be to listen and learn from the incredible activists that I meet, and search for ways to support the work that they are already doing. In recent months, divestment has been growing rapidly and getting a lot of national media attention, mobilizing thousands of students and bringing new attention to the climate movement. However, divestment is neither the most challenging nor the most important work in the struggle for climate justice; divestment campaigns are fundamentally about solidarity, not about fighting on the frontlines of extreme energy extraction or climate change. By definition, divestment is a tactic for those at institutions that possess large amounts of capital to invest or divest at their will, whereas fossil fuel extraction disproportionately takes place in low-income communities and communities of color. Not surprisingly, these are the same communities being disproportionately affected by climate change, since they lack the economic resources and governmental support to respond. As the movement for climate justice grows — which it will be doing over the next week — I want to ensure that the struggle is not centered around wealthy institutions like mine, but rather that we center it around those most threatened and most hurt by the extraction and consumption of fossil fuels. Therefore, my aim will not be to promote divestment, but rather to find ways to expand my solidarity organizing from a regional to a global level and build networks of support with people around the world. My vision for international solidarity and support networks is not one where we are all fighting the same campaign or where there is top-down leadership telling local communities how to fight for climate justice. Rather, I envision a myriad of local campaigns with local leadership that can support and strengthen each other, helping each other win and build power from each victory as we all fight environmental degradation around us. These campaigns already exist, and now is the time to connect them. The forces — corporations and governments — causing and allowing climate change to happen are powerful; so we must build a movement even more powerful to fight them. I don’t know yet what these global solidarity networks are going to look like — there’s no way I could before going to Istanbul and talking with all of the organizers who will be there about what support they need and how we can provide that for each other. But I am excited to go and find out. What better place, no less, than a city that is in a current state of uproar, sparked by a struggle for environmental justice. I may just end up learning more than I could have ever imagined. Meanwhile, the entire world of SCIENCE, lazy copy and paste news editors and progressivism had allowed bank-funded and corporate-run “CARBON TRADING STOCK MARKETS”(ruled by trustworthy politicians) to trump the UN’s efforts into 3rd world fresh water relief, starvation rescue and 3rd world education for just over 28 years of insane attempts at climate CONTROL. Science has never said it will happen, only might happen despite being at the brink of unstoppable warming. Not one single IPCC warning was without “maybes”. Help my planet is on fire maybe? If science just said it will happen, not just might happen or said their crisis was as inevitable as they like to say comet hits are, the debate would end instantly. It seems to me that science has done its job. We have known what we need to know to act against climate change for decades. The fact that governments have not acted is not the result of scientists using ambiguous language. In fact, it was the Bush administration that censored its own scientists to downplay the threat of climate change. One of those scientists, James Hansen, spoke out against this censorship and has since become one of the boldest voices for climate action — writing Op-Eds for the New York Times titled “Game Over for the Climate” and engaging in civil disobedience protests. Sadly, scientists alone cannot sway governments. It is going to take a massive and broad-based movement. And that is why meetings like the Global Power Shift are so important. They are helping to lay the groundwork for such a movement. Fantastic overview, Ali! I can’t wait to read about what you find in Turkey. Ali, I’m a big fan of climate justice, but why do you need to fly to Istanbul? How many tons of CO2 and other emissions will your trip cause? Isn’t there another way for you to work with others without engaging in such ecologically destructive behavior? EC- Why do folks only complain about climate activists who fly? The problem isn’t them– it’s the people who fly for other reasons. In a business, you need to spend money to make money. In the effort to stop climate change, you have to make carbon emissions in order to balance them. I don’t know anyone who complains only about the flying of climate activists. But climate and environmental activists should set an example for others. My experience is that they very rarely do. Many that I know have enormous environmental footprints–often uncritically justified in the name of the struggle, one that, conveniently, allows them to travel the world. Like other privileged people, they typically don’t ask the types of questions that truly challenge themselves. As this article from Alternet (http://www.alternet.org/story/148675) discusses, those who identify as “green” tend to have bigger footprints than those who don’t. Yes, there are no doubt times where you have to make carbon emissions to change the world for the better. But I’m pretty confident that, at least in many cases in which lots of emissions are produced in the name of the good fight, viable, ecologically-light alternatives exist–and that applies to the climate justice gathering in Istanbul as well. Whether or not the GPS organizers and attendees seriously considered and debate such alternatives, I don’t know. But knowing a lot of people who have attended such gatherings in the the past, I really doubt it. The thing is, again, privileged people rarely challenge themselves (and they typically love to travel). That’s how privilege works and endures. We need to challenge wherever it exists–perhaps especially among those seek to wage nonviolence, but, through their practices, regularly perpetrate violence. Let’s be clear, a movement against climate change is a movement against our very way of life. As such, it is a movement like no other, and it is going to be filled with contradictions and inconsistencies. After all, we live in a fossil fuel economy. There is very little one can do — short of living off grid and disconnected from society — to avoid being complicit with the burning of fossil fuels. Awareness and collective action, not individual purity, is our best weapon at this point. Let’s also be clear that the 500 young people gathered in Istanbul this week have contributed far less to the climate crisis than the older generations on this planet. Furthermore, as the inheritors of this crisis, they will likely be living much more sustainably than their forebears — be it by choice or necessity. So, to focus on their air travel to this one conference seems a bit unfair. That being said, it’s not a bad question, EC, to wonder about the alternatives. I’m certain the organizers contemplated that. They spend a good deal of their lives on Skype communicating across great distances already. I’m sure, however, they felt this first-of-its kind gathering was a necessary one to have in person. These people are ridiculous. Worrying about carbon dioxide emissions, and flying to Istanbul and back? can’t they have their meeting on Skype? Or are the meetings they keep having just too much fun to give up? Are they concerned, or not? looks like not to me. No they do not need to spend carbon emissions to balance them. They should practise what they preach. reduce carbon footprint. Thanks Bryan for your thoughts. If people are flying to conferences, they are not living sustainably. (Just do the numbers if you doubt me.) In other words, they have not “contributed far less to the climate crisis than the older generations on this planet.” Instead they are part of a small portion of the world’s population responsible for the vast majority of ecological destruction. You are right to say that as long as we live in a fossil fuel society, we will be be complicit with its use–unless we go live in the woods, off the grid. And sometimes, activists and organizers will need to use more than their fair share to further the struggle. But flying to Copenhagen–as many of my eco friends did–strikes me (especially with the benefit of hindsight) as a waste of time and as environmentally irresponsible. Yes, we need mass movements and we need to build them. Re: climate change, we desperately need those movements in New York City, where I live, and in the United States. I’m not at convinced that the way for U.S.-based activists to help bring these about is to fly to a conference in Istanbul. I appreciate people’s passion about climate change — but I just want to thank Ali for taking the time to go to Istanbul and strategize with youth from around the world. We’re not going to fight climate change with individual actions. 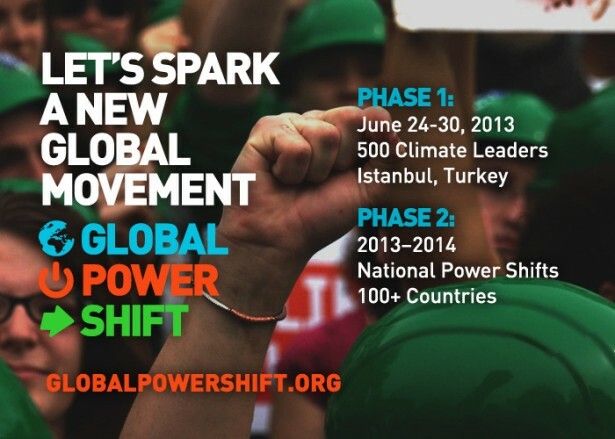 It takes movements, and global power shift was about building a global movement against climate change. Will we ever reach true equality?